After the top three are three more FCIAC teams: No. 4 Wilton, No. 5 Staples, No. 6 Ludlowe. 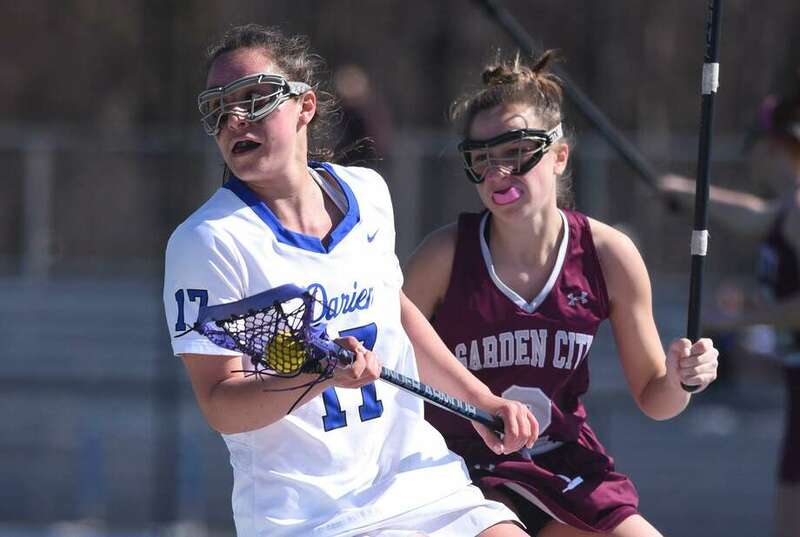 Staples, which was unranked in the final poll last season, had one of the biggest wins of the young season when it knocked off perennial league power Greenwich 16-10 on opening day. Glastonbury is No. 7 with Conard at No. 8, followed by two more FCIAC teams: No. 9 Ridgefield and No. 10 Greenwich. Kyle Kirby, Staples: The senior had six goals, two assists and 13 draw controls during the Wreckers’ 16-10 win over Greenwich in the season-opener. She also had five goals and two assists against Warde in Staples’ second game. Shira Parower, Staples: Sophomore attack tallied six goals and three assists in the 16-10 season-opening win against Greenwich. Olivia Gianakos, Waterford: Gianakos racked up 12 goals as Waterford defeated Valley Regional, 20-12, on April 5. Annie Uyeki, North Haven: The All-State senior scored five goals and had one assist as the Indians opened the season with an 11-10 overtime win against Amity on Tuesday, April 2. Three days later, Uyeki had seven goals and two assists in a 20-14 victory against Hamden. Morgan Reilly, Bunnell: Reilly, a sophomore, had six goals and one assist in the Bulldogs’ 11-7 win over Foran on Thursday, April 4. Samantha Forrest, Glastonbury: The sophomore netted nine goals in the Tomahawks’ 14-7 victory against Joel Barlow on Saturday. Daniel Hand at Staples (Ginny Parker Field), Thurs., 5:30 p.m.: Staples has kicked off its season with wins against Rye, Greenwich and Warde. The Wreckers face another test against perennial SCC power Daniel Hand, last year’s Class M runner-up. Newtown at New Fairfield, Thurs., 6 p.m.: A clash of the last two SWC champions. Newtown, the 2017 league champ, defeated New Fairfield 9-6 last year at Blue and Gold Stadium, but the Rebels followed with a seven-game win streak, sweeping the SWC and Class S titles. Westhampton Beach, NY, at New Canaan (Dunning Field), Friday, 6 p.m.: New Canaan’s third out-of-state contest in six days. The Hurricanes defeated the Rams 9-8 in OT last year. Longmeadow, Mass., at Greenwich (Cardinal Stadium), Monday, 4:30 p.m.: The Cardinals are looking to right the ship after opening the season with three straight losses. This is the first of three FCIAC opponents for the Lancers, who play at New Canaan on April 20, and host Darien May 13. Greenwich at Wilton (Lilly Field), Wed, 6 p.m.: The first meeting of the FCIAC’s “Big Four” this season. Last year’s meeting went to Wilton, 12-11 overtime, at Cardinal Stadium.